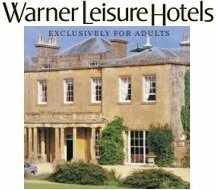 Holidays, weekends and shortbreaks for Adults : Warners Holidays, exclusively for adults in the UK. Warners Breaks have hotels and coastal resorts in thirteen locations around England. All of Warners holidays are exclusively for adults. Whether you're looking for a lively activity short break, a cultural holiday or a relaxing spa break, Warners have a wide range of weekend and short breaks that will ensure that there's something you, whatever your holiday requirement. We're featuring Thoresby Hall Hotel in Nottinghamshire our "selected" hotel for this month. Featuring fantastic grounds, lovely dining, and a relaxing Spa - Thoresby Hall Hotel makes a fantastic Warner Hotel to spend a few enjoyable days. We all need a good nights sleep, so the luxurious accommodation is second to none ar Warners, ensuring you will feel bright and breezy the following morning. So, as you can see, a short break at a Warner holiday resort will give you the perfect break you deserve. Whether you are planning a midweek break, or a weekend getaway, you'll find your Warner short break packed with excellent facilities. All The Warners Breaks hotels and resorts have fantastic entertainment and activities to give you a perfect holiday. All your evening entertainment is catered for whilst you enjoy your stay at one of Warners leisure hotels or resorts. You can enjoy a pre dinner drink, or an evening night cap, whilst enjoying a variety of live performances. Or you can take in a visit to the "Late Lounge" where you watch a variety of live performances every night of the week; music, dancing and comedy. Plus some live shows performed by the UK's top artists.